You can have summer camp-inspired fun right in your own back yard! 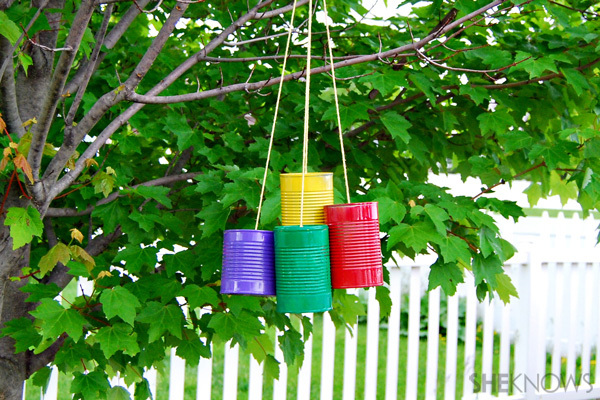 Keep kids entertained this summer with this easy outdoor wind chime craft! Remove any labels from the cans and thoroughly wash and dry them. Paint each can a different color. Once the first coat of paint dries, apply a second coat. Carefully hammer a large nail into the bottom of the cans to make a hole for hanging. Cut a 2-foot length of string for each tin can. Feed the string through the hole in the bottom of the can and tie a knot in the inside to keep it in place. Repeat for all of the cans. Gather all of the strings so that the tin cans hang in a bundle. Vary the height of the cans, but make sure they all touch so that they will make noise in the wind. Tie the strings around the branch of a tree outside.